I bought myself flowers today! I bought myself flowers today! I also vow to buy myself flowers as often as I can for the rest of my life. I no longer have to wait for a handsome prince charming to arrive at my doorstep with a lovely bouquet of flowers nor do I have to anticipate a special occasion for my loved ones to gift them to me. I take the initiative to buy them for myself. This was a potent statement because up to that last tip the book had talked about writing lists, relationships, getting creative, taking action, etc…Which are all wonderful tips but this last tip was strategically tip 100 for a reason- because it is the most powerful tip and in a slightly higher energy field than the rest. Often times we wait for the world to provide us with the opportunity to be happy. We wait to see what card will be dealt to our lives so we can react to it. We can be guilty of sitting back until things get better or worse. Being happy and living in a beautiful environment is an inside job. I used to think that life was treating me unkind then I realized that I AM LIFE and I treat myself however I want. We tend to think that magical outside sources have control over our life and our feelings. I have spent years of my life on autopilot allowing people and circumstances to predict my present situation and set my mood. As I walked past the flowers at the grocery store, I wondered why it took me months to take John’s advice. Today I take control over my life and my environment. 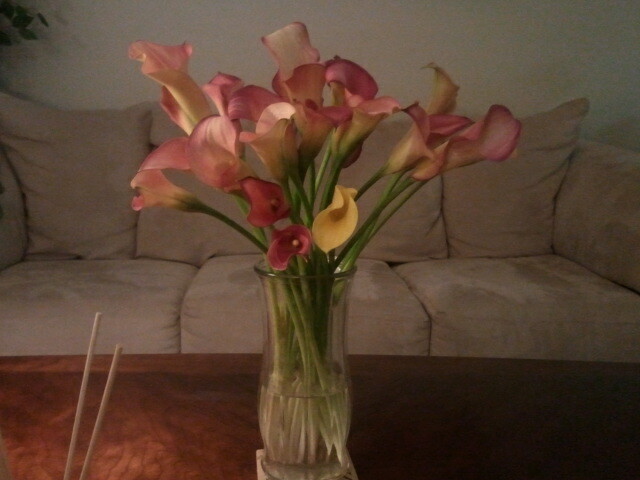 Flowers are a small kind gesture to myself but they will remind me of the control I have over my life and my feelings. They symbolize freedom from outside forces and the ability I have to honor myself. Buy yourself beautiful flowers today- they don’t have to be expensive and it can be just one if you like. You can also find your own different way to honor yourself. Make your living area beautiful. Our home is our sanctuary and it is where we can prepare ourselves to face our inner and outer world. What an awesome message! And the up side of buying yourself flowers is that you get just the right ones exactly when you need them 🙂 I love your comment about life treating you a certain way and your realisation that ‘I am life and I will treat myself the way I want’ I will be looking up John C Maxwell – sounds like a great tape. I am glad you enjoyed this post, Meaghan. I love John! You must listen/read Failing Forward- very inspiring! PS After posting this blog I actually had a “handsome prince charming” show up at my door step with with a lovely bunch of flowers for me.